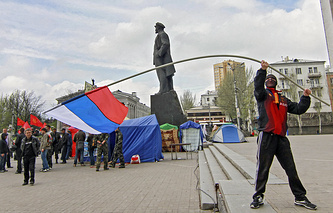 DONETSK, April 24. /ITAR-TASS/. The leadership of the recently self-proclaimed Donetsk People’s Republic plans to hold a referendum simultaneously with east Ukraine’s Luhansk region, co-chairman of the Donetsk People’s Republic presidium Denis Pushilin told ITAR-TASS. “A referendum will be held no later than on May 11 and it is highly probable that Luhansk will also hold it with us no later than on May 11. Ludansk just has to confirm similar wording of the question. Our question is as follows, “Do you support the independence of Donetsk people’s republic?” Pushilin said. In his words, sovereignty gives the right and opportunity to establish federative and confederative relations with any country regardless of its geographical position, including Russia and Ukraine. “Or to stay an independent republic that is certainly hardly probable, but there will be such opportunity in theory,” Pushilin noted. 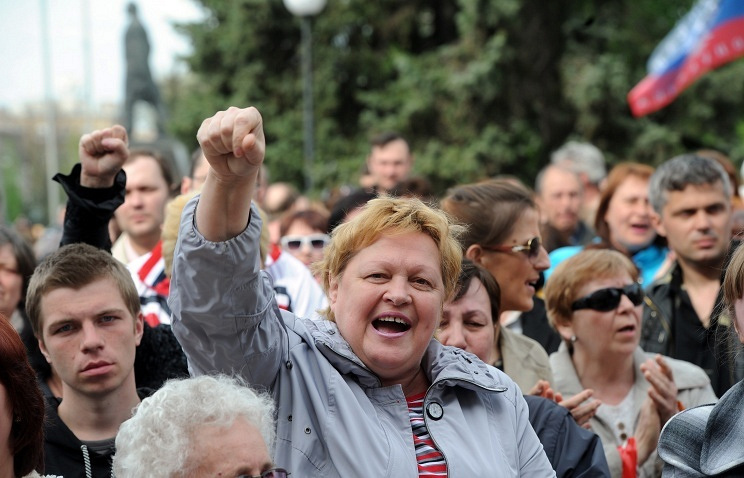 As many as 3.5 million voters living the Donetsk Oblast can vote at a referendum over sovereignty, Pushilin said. “I do not have exact data at the present moment, but around 3.5 million people can vote in Donetsk region. The minimal turnout is expected at 60% of all regional residents entitled to vote,” he noted. Central and district election committees were already formed in Donetsk region and “printing of ballot papers will begin soon,” Pushilin said. No Russian troops are staying in the self-proclaimed Donetsk People’s Republic, Pushilin said. “There are none of them here (Russian troops) and probably there are some reasons for this. Although it would be easier with them, as they would speed up holding of a referendum and would ensure it to be within legal field,” Pushilin believes. In his words, “all rumors about Russian troops in eastern Ukraine are just information distortions from Kiev."